This week has flown by, partly because the days have started late. The night feeds seem to have ramped up again, something I’m putting down to the twelve week growth spurt. We didn’t have any lengthy stretches worth noting this week. Instead we had cluster feeding for the evening, and then a feed between 11 and 12, another between 2 and 3, and another between 6 and 7. Because Charlie was getting up for work around the time of the last feed, I threw back the duvet, lay Little Woman down beside me and fed her lying down. We both fell asleep that way, and slept until 9 or 10 each morning, for probably my most restful sleep of the night. Just as well because she barely naps during the day most days so once we’re up, we’re up for the day. On Monday morning, the public health nurse phoned to ask if she could call that evening for Little Woman’s three month check up. It was almost two weeks early but I went ahead with it anyway. All is good. The PHN said she’d like to see her lifting herself higher during tummy time at three months, and for a minute I got all defensive-mammyish and replied “Well she’s not three months for another two weeks, and we do tummy time every day.” And then I caught myself and laughed. I know she’s getting plenty of tummy time because I was so concerned about her neck turning to just one side a few weeks ago that I’ve been diligent about it each day. A few quick checks including a weight check later and we were all done. Little Woman is weighing in at a hefty 5.28kg (11lbs 10oz), and she’s 60.5cm long. No wonder those 0-3 month clothes are getting tight. The following day I spent the day sorting through her clothes, setting aside those she’s outgrown for the charity shop, and washing and preparing the 3-6 month clothes which we’re clearly going to need very soon. It took hours! Who knew one baby could have so many clothes. I also visited a couple of local primary schools and put her name down for a place. 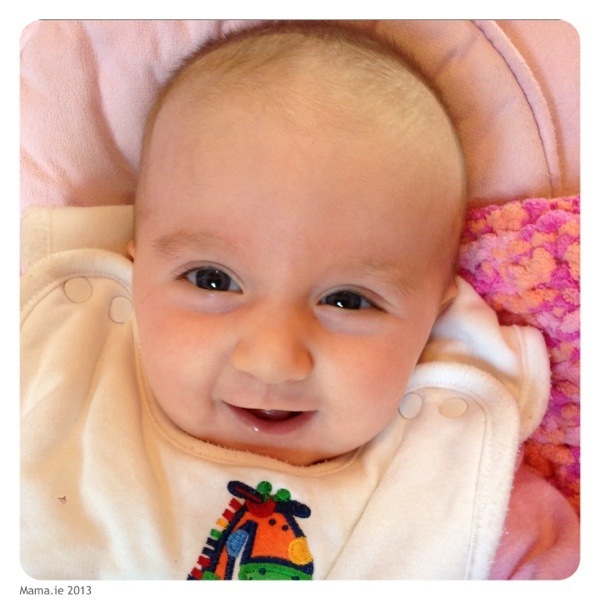 Yes I know – crazy – she’s not even three months old. But the school enrolment system is broken in my local area, with more kids than places each year, and I refuse to end up worrying that we won’t have a place for her because I’m lax about it the way I was with Little Man. Where we did have changes was in her physical development. Now she’s actually playing on the playmat when we lay her down on it. She bats at the toys and giggles when they swing back at her. She’s attempting to grab them but not managing it yet.